Katie Fisher is ecstatic. Pro basketball star Brady James has proposed, and she can't wait to start planning their life together. She's confident she'll make it down the aisle this time--but it still may be easier said than done. A high-society Houston bride has Katie and the Cosmopolitan Bridal team scrambling to get the perfect dress done in time for her spectacular wedding. Meanwhile, Katie finds herself bombarded with everyone's competing visions regarding her own special day--and she's beginning to worry that her own ideas will get lost in the crossfire. Will she ever manage to settle all of the details for her perfect day? Or will bridal shop chaos and overzealous friends and family make a mess of everything? Fan favorite Janice Thompson gives readers what they've been clamoring for: another funny, romantic romp with a Texas twang. Janice has been crowned the Queen of Romantic Comedy, and it is a title well deserved. Every book hits just the right note of hilarity, with deep undercurrents of faith and family. "Every Bride Has Her Day" concludes a wonderful series about weddings in the South. Katie Fisher accidentally won a wedding dress even though her beau hadn't popped the question as yet. That opened a door to a new way of life for Katie in "Every Bride Needs a Groom". Offered a position at the bridal boutique, she settles into life in the big city while helping to bring families back together in "Every Girl Gets Confused". In "Every Bride Has Her Day"...you guessed it--Katie is getting married! But she's not the only bride in the bunch...nope. Bridal fever has hit her home town of Fairfield, Texas. Which is a good thing...and a not-so-good thing. Turns out folks from her hometown are rather set in their ways, doncha know! Can Katie plan her own wedding, help plan the weddings of some of her closest friends, and settle a feud that has divided Fairfield and threatens to spoil her happiest of days? Faith, family and festivities abound in "Every Bride Has Her Day". My thanks to my friends at Revell Publishing for my copy in exchange for an honest review. 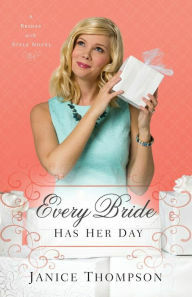 I highly recommend any book by Janice, and "Every Bride Has Her Day" is sure to be a fun read!